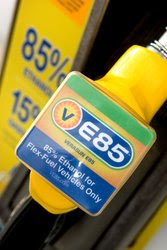 Kroger will offer VeraSun’s branded E85, a blend of 85 percent ethanol and 15 percent gasoline, for Flexible Fuel Vehicles (FFV) at 20 different locations in and around the Dallas and Houston metro areas. With this addition in Texas, VeraSun now has more than 140 retail fueling stations in 13 states and the District of Columbia. VeraSun and Kroger initially partnered in August 2007 to open VE85™ fueling locations at 20 Kroger convenience stores primarily in Ohio, making Kroger the first national retailer to sell VE85™. Headquartered in Cincinnati, Kroger operates almost 2,500 supermarkets and multi-department stores in 31 states. The company also has more than 750 convenience stores and 650 supermarket fuel centers. Currently the state of Texas has 30 retail E85 fueling locations, 20 of which are Kroger locations. According to the Texas State Energy Conservation Office, Texas has more registered flexible fuel vehicles than any other state. The National Ethanol Vehicle Coalition estimates that number to be more than 500,000 registered FFVs. E85 is a high-octane, cleaner-burning fuel, with an octane rating of 100 or greater and the highest oxygen content of any fuel available today. The Argonne National Laboratory reported that the use of 6.5 billion gallons of ethanol in the United States during 2007 resulted in the reduction of greenhouse gas emissions by approximately 10 million tons. The use of E85 alone contributes to a 20 percent reduction in ozone-forming pollution and a 30 percent reduction in greenhouse gas emissions. Locate a nearby Kroger HERE.